Four Levels of the poem "DO NOT CUT DOWN THE TREES, BROTHER WOODCUTTER". 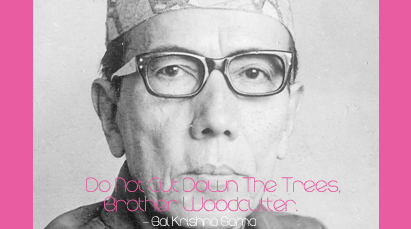 "DO NOT CUT DOWN THE TREES, BROTHER WOODCUTTER" was written by famous Nepalese Dramatist and Poet 'Bal Krishna Sama (1902-1981). Bal Krisha Sama is also regarded as the "Shakespeare" of Nepal. In Nepali Language, he is known as "Natya Siromani". As a dramatist ("natak-kar") he was a literature great of Nepal. His contribution to Nepali literature can never be forgotten. He was the son of General Samar Shumsher Jung Bahadur Rana and Kirti Rajya Laksmi Rana. Bal Krishna Sama completed his high school from Durbar High School in Rani Pokhari and took up science in Tri Chandra Campus. During his second year of academic studies, he was sent to Dehradon for army training as an army captain, afterwards he became a Lieutenant Colonel, by the prime minister Chandra Shumsher. Summary, Word Meanings & Question Answers Of "Do Not Cut Down The Trees, Brother Woodcutter"
The speaker in the poem addresses to the woodcutter and requests him not to cut down the trees because he thinks they are mothers. They are dead because they cannot appeal with us. But, they protect us from sun and rain. They give us shelter, firewood, fruits and flowers. They constantly kiss us with their lips but when they weep, they ooze sap (चोप निकाल्नु). They give us air but they cannot speak. So, the speaker requests again to the woodcutter not to cut the trees. He further describes that in the winter, we gather inside our home, sit around the fire, sing and talk and then we got to inside warm quilts (सिरक). But, mother trees stand outside in the cold covering by white frost (तुसारो) and remain silent. They pass night thinking of our childhood. They hear us singing the songs they taught us. They always want us to laugh. Similarly, they love us and give affections but they cannot express their inner thoughts to us. When springs comes, they broaden their leaves and arms, and blossoms for us. In the final two lines, he again requests the woodcutter not to cut off the branches of the trees and not to chop them down because they are our dad mothers. The poem informs us about the importance of conservation of trees. The poem shows that the poet is a pagan who thinks the trees as his mother. Trees are the part of nature. They gives us fruits and firewood. Thus, trees are like one dead mother, who always protects us from difficulties, but takes nothing. The poem tells us no new things especially for students of Bachelor level (BBS,BBA,BA, etc) because what the poet wants to tell us is already known to us. So, this poem is not worthy for students of this level. Since, it is the translated version; the poem might have lost it's originality. In Nepal, almost all the people are pagan, people believe in multiple gods. We worship trees as god. This poem has given me sense that this might be a good poem for western readers who are not pagan. They do not see trees as god. Four Levels Of "Do Not Cut Down The Trees Brother Woodcutter"
Literal Comprehension Of "Do Not Cut Down The Trees Brother Woodcutter"
Interpretation Of "Do Not Cut Down The Trees Brother Woodcutter"
Critical Thinking Of "Do Not Cut Down The Trees Brother Woodcutter"
Assimilation Of "Do Not Cut Down The Trees Brother Woodcutter"
0 Response to "Do Not Cut Down The Trees, Brother Woodcutter | Four Levels"